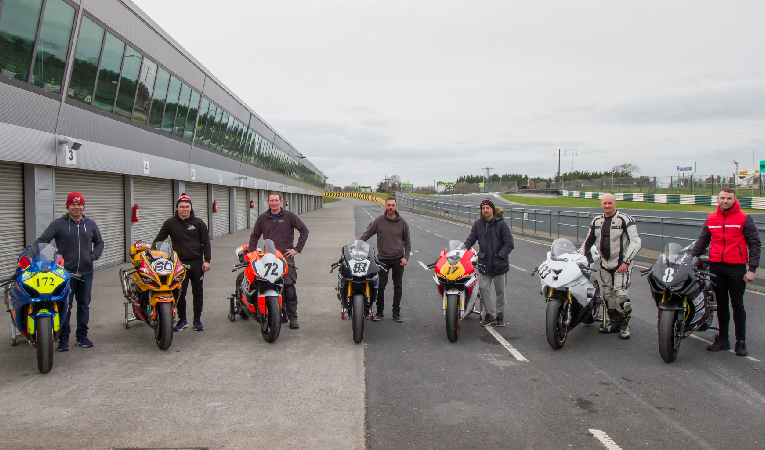 The 2019 Dunlop Masters Superbike Championship season kicks off at Mondello Park on April 6th & 7th, with a strong line up in the headline Superbike class, including seven different manufacturers. Reigning champion Richie Ryan will start as favourite to make it three in a row having dominated pre-season testing less than two weeks ago, but he will have the biggest ever line-up of Pro riders to contend with, as there are currently eighteen registered for the top Superbike division. For the second year in a row the season opener will include the Masters Motorcycle Show, which will take over a large part of the Mondello Park paddock. The show will be headlined by international stunt riding star, Mattie Griffin, and will include Minibike racing demonstrations by the Irish Minibike Championship, Indoor exhibits and outdoor exhibits. Access to the show area will be included in the Masters ticket price, which is set at just €10, for tickets bought before Midnight on Tuesday April 2nd, making this event the most attractive ever Mondello Park event for Masters fans. The opening Dunlop Masters Superbike Championship event of the year will see three rounds of the championship completed for most classes. Qualifying and round one will be contested on Saturday with rounds two and three scheduled for Sunday. The Sunday action will be spiced up for 2019 with the introduction of a partially reversed grid for Superbike and Supersport race three. For the final race of the weekend the front two rows will be reversed with the riders who finish fourth, fifth and sixth, promoted to the front three positions. The Superbike grid will be the most varied it has been in the ten year history of the Masters with Yamaha, Suzuki, BMW, Honda, Kawasaki, Ducati and Aprilia all represented by brand new or almost new machines. Richie Ryan will be the top of the Yamaha list, closely followed by Supersport Cup champion Keelim Ryan. Peter Moloney will be one of Ryan’s main rivals, on one of four new Suzukis, while Luke Johnston is likely to be the fastest of the BMW riders. Reigning Superbike Cup champion Chris Campbell, 2017 Superbike Cup champion Andrew Murphy and the ever improving Jamie O’Keefe will all be Kawasaki mounted. Emmet O’Grady will ride the first of the new generation Honda Fireblades to compete in the Masters, with Ducati also being represented by a single bike ridden by another Superbike Cup graduate Michael Prendergast. Aprilia will have two machines on the grid with Stephen Magill as the quickest of these. The Supersport class boasts the biggest entry of the event with more than thirty five bikes expected. The main contenders from 2018 have moved on leaving a very open field. Kawasaki rider Graham Whitmore was fastest in pre season testing and will face a strong field of Pro riders as well as a long list of Cup contenders if he is to take his first Supersport win. Dave Butler and Luke Higgins are Whitmore’s most likely rivals with Butler starting his second year in Supersport on his Kawasaki and Higgins having his first season as a Pro rider onboard a brand new Yamaha, following a year off. Michael Owens, Trevor Landers, Darryl Sharkey, Oisin Maher and Kevin Dempsey should be the top Supersport Cup contenders. Of the supporting cast the Twins class looks particularly strong this season with a full grid expected, headed by a dozen of the faster Supertwin bikes. The Principal Insurance Pre-Injection class is also making a comeback with increased entries and a new crop of riders at the front, following the graduation to Supersport by last seasons dominant champion, Ian Prendergast. Sidecars also look stronger than they have for many seasons with seventeen of the three wheelers entered. The programme will be rounded out by a strong combined grid of Moto400 and Classic Superbikes, who will race twice on Saturday, and the Junior Cup racers who will be on track for two races on Saturday and one on Sunday. Admission to the opening Dunlop Masters Superbike Championship event is just €10 for adults, when booked by Tuesday April 2nd, with under 16’s admitted free. From Wednesday onward adult tickets will be €12.50 booked in advance, with on the day admission set at €15.00. Tickets can be purchased on line HERE and all admission includes a complimentary event programme.